Welcome to 2015 everyone! It has been a wonderful Holiday season here at my house. Full of baking, crafting, and spending time with friends and family. But the New Year is upon us, and that means a time of reflection and goal setting for the next 12 months. I’m sure you all know by now how committed I am to my printable modular planner line. It is something I use every day, and I am very passionate about. 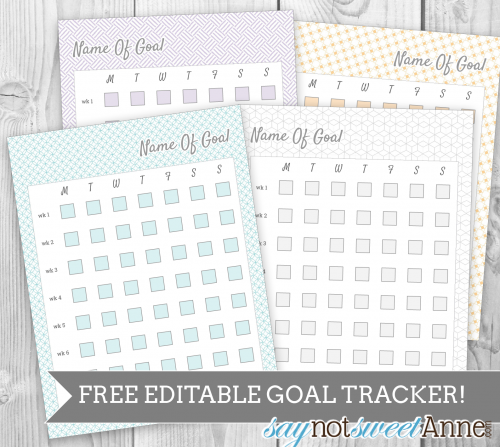 So, when I decided to make a printable goal tracker- I decided I’d better make it match! 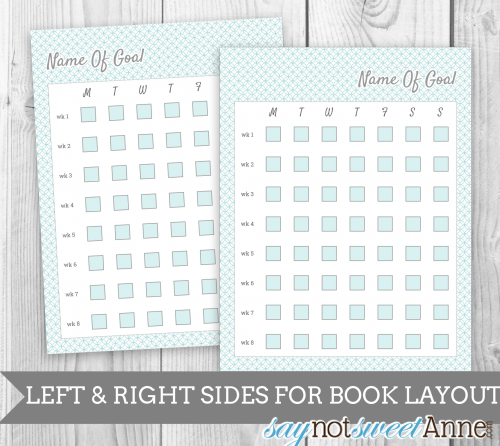 Of course, there is no need to use this printable with the planner. You could just as easily tuck it into any binder, notebook, or hang it on the fridge. The Google Doc format means that you can edit ALL the text, the colors, anything you want! Add the name of your goal, change the number of weeks you are tracking, whatever suits your needs. I’m personally going to use this to track some prenatal exercises I’ve been avoiding. Having a pretty check box that I can tick off at the end of the day makes me feel accomplished, even when my lower back is aching from the effort. Open the link and click “Save a Copy”. Rename it so you know what it is. Edit the text. There are actually two layers of text, one white and one grey for the title. You’ll need to edit both. Move the grey layer, edit it. Then edit the white layer. Then put the grey layer back on top. See below for a visual. Edit the other text if you want to. Click “Print” to save your tracker as a PDF anywhere on your computer. Then you can print it and be on your way! I hope that you all enjoy your weekend, and that you achieve all of your goals!! Let me know if for some reason the Google Doc isn’t working. I’m still new to sharing this way – but it makes things editable and THAT IS AWESOME!! You’re SO Awesome!!!! Thank you!!! Thanks so much for this. It was exactly what I was looking for. Plus, I got to figure out how to work with a Google Doc for the first time. Thanks again! Well this is frustrating. 🙁 I guess I’m not so technically savvy after all. I can move the title, but I can’t get the edit box to show up.